Wixiban: The New Brian Evethers? Shortly after the design part of A Time to Stand had wrapped up, and the expansion was on its way to Art, I was chatting to a Green Badge about the set. The Green Badge (who has full access to the Design Boards, so knew what was coming) asked how I got on, and which cards in particular were “mine”. I said that Wixiban was one that I considered ‘mine’; I’d put forward the text, and when a pitch was made to add something that I thought was detrimental and would ultimately consign him to the binder, I made my case. My case was heard, considered, and his text remained unchanged. “Oh, Wixiban, the new Brian Evethers”, the Green Badge said. What?! I was shocked; Evethers is awful. Wixiban’s nothing like Evethers. I asked for an explanation. Okay, I’ll admit, this got me worried: Wixiban is a wall-o’-text*, but that’s all they've got in common. And that got me thinking: is that enough to condemn him to the binder? Is a wall of text necessarily a bad thing? Will the players always wince at seeing one? I’ve read what Charlie has written on the tenets of design, and I think the KISS (Keep It Simple, Stupid) attitude is a fine precept, but what happens when the mechanic you want to convey can’t be summed up in a single line (like the oft given example of perfect KISSing At What Cost?)? If you can’t get the mechanic into one or two lines (and looks like it’s going to be a block), should that mechanic be abandoned altogether? Throughout Phase II, things have ‘mattered’. In A Time to Stand, “missions mattered”. At the start, Keith drew up a list of all the characteristics one associated with missions. The list ran to 19 items, covering everything (we could think of) from ‘type’ and ‘span’, to ‘status (complete or incomplete)’ and ‘number of dilemmas on the mission’. We looked at the list and noticed a few fit naturally with the themes for the affiliations we were dealing with. One of the ‘natural fits’ on the list was the Region keyword. 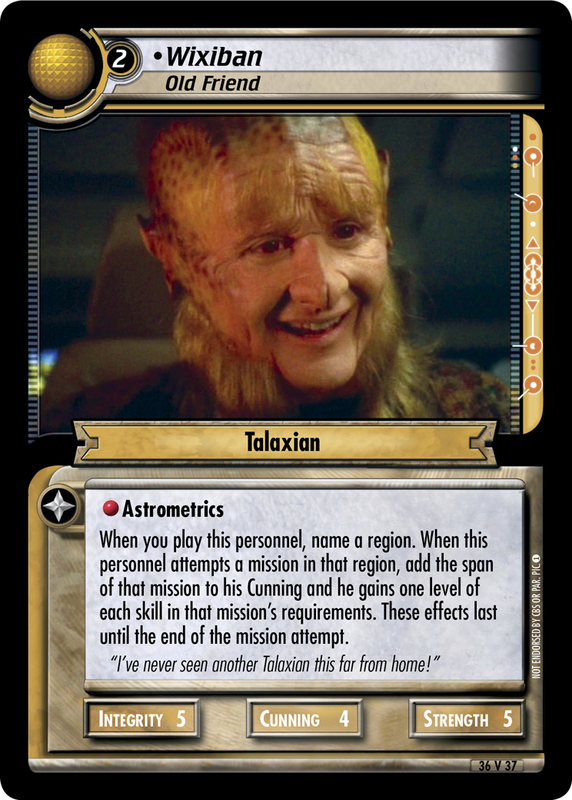 We knew the Maquis should care about the DMZ, we’d spoken about a Sector 001 mission for Starfleet, and we’d bandied about the idea of creating missions for the less-explored regions (e.g. Nekrit Expanse, The Void, or the Borderland). The first two ideas came to fruition, but the last one didn’t. This still left the less-explored regions less explored. Unfortunately, something as involved as this would require a wall of text. Was that going to be a problem? After putting fingers to keyboard and typing it up, we didn’t think so. Neither (thankfully) did the testers. No – just get it as concise as you possibly can. Hang on…that’s essentially “keeping it simple”. Anyway, here’s Wixiban, Old Friend – a wall of text for sure, but not the new Brian Evethers. * Although not in Evethers’ league; including skills, Wix clocks in at 49 words, while Evethers comes in 60.